A classic burger and fries is All-American comfort food! 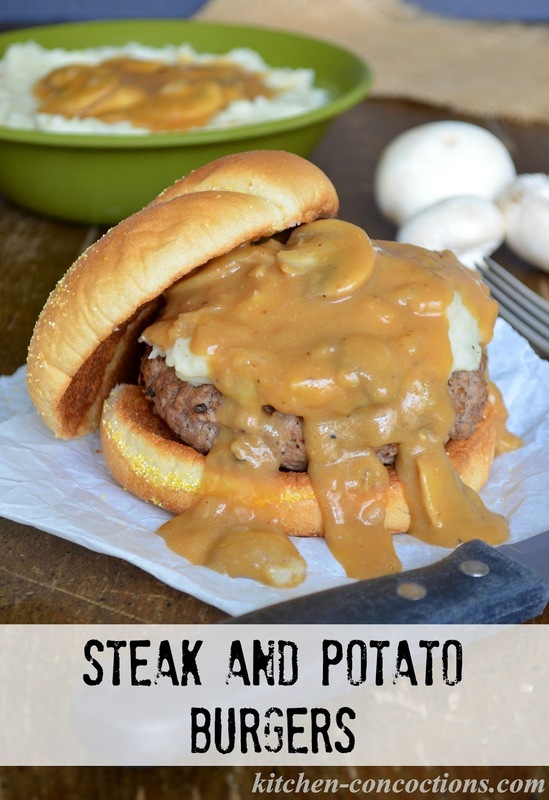 Equally as comforting is a steakhouse dinner, with a perfectly cooked steak, creamy mashed potatoes all topped with a hearty mushroom gravy. This recipe takes all the favorite flavors of a fancy steakhouse dinner and transforms them into a knife and fork kinda burger! I love the fall! While most people tend to cook out on the grill during the warmer days of summer, the fall months (before the bitter cold of winter sets in) is absolutely perfect for firing up the grill! Nothing excites me more than cooler fall days, colorful leaves, backyard cookouts and watching football with friends! Gathering on the back porch, a cold drink in one hand, surrounded by good company and a grill sizzling with tasty food, is simply picturesque. My favorite food to cook on the grill, happens to be America’s favorite, burgers. Nothing beats a juicy, all-beef patty grilled to perfection, topped with a thick slice of melted cheddar cheese, plump tomatoes, crisp lettuce, tangy mustard, all sandwiched between a toasted bun. Taking that first, mouthwatering bite of burger, instantly takes me back to so many happy memories. I am quickly transported to my childhood and my first exhilarating, yet terrifying, summer camp away from home. To college tailgating, cheering on the school’s football team, all while making new friends. And of course to many 4th of July celebrations spent on the lake celebrating life, family and freedom! While burgers are quintessential to a cookouts, mastering the perfect burger, requires a little knowledge and know how. 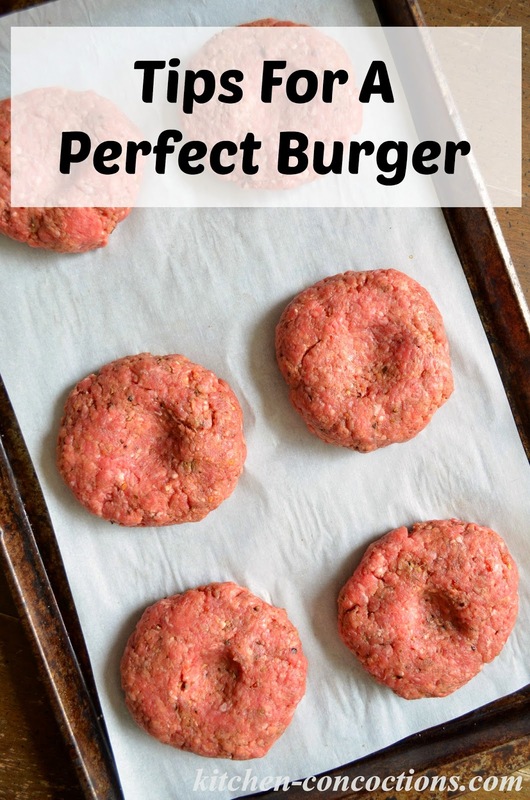 Below are a few of my favorite tips to make sure your next burger is flawless! The meat: I like to use equal parts ground sirloin and ground chuck. The ground chuck, with 20 percent fat, helps yield a juicy flavorful burger. While leaner, ground sirloin adds an extra layer of beefy flavor and helps prevent the meat from shrinking too much. Ground turkey, chicken, fish, pork and lamb can also be used to make fantastic burgers. Seasonings: Some burger traditionalist believe in simply seasoning burgers with only salt and black pepper. However, fresh onion or garlic, fresh or dried herbs and spices, cheese, pickled condiments, like jalapenos, and even prepared sauces, such as Stubb’s Texas Steakhouse Marinade; can all be added to the burger mixture to for an extra pop of flavor. While these seasonings and sauces can be mixed directly into the burger mixture, salt and pepper should only be added to the patties right before cooking, as salt dissolves muscle proteins, which can create a tough, dry burger. Before forming the burger patties, pinch off a piece of your burger mixture and cook it to check the seasoning amounts. Forming the patty: Chill the meat for 20-30 minutes before shaping burgers. Wet hands with cold water and divide meat into equal portions. 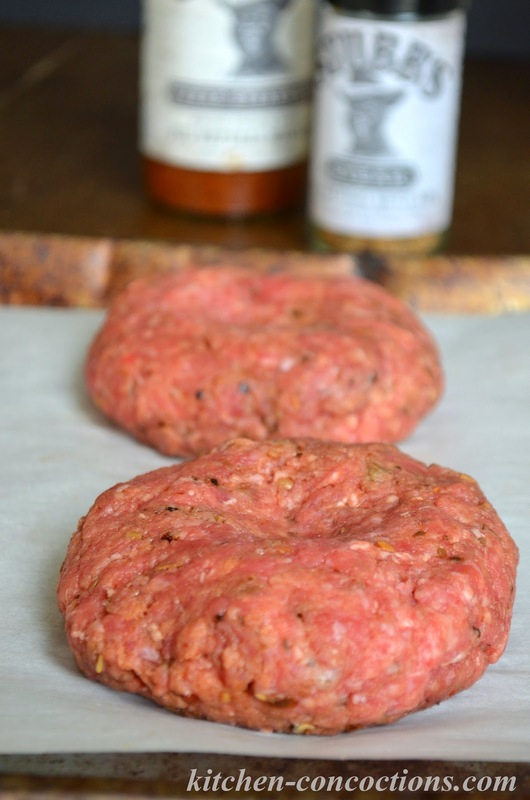 Shape beef into ¾-inch thick patties. Using your thumb, press a small dimple into the center of the formed burger. Be careful not to overwork the meat as it will yield a tough burger. Cooking: Whether grilling or pan searing your burgers, make sure your grill or pan is extremely hot before adding the burgers. Never, ever, press down on the burger patties as they cook. This releases all the natural juice and will result in a dry burger. Also, avoid closing the lid on the grill and over-flipping the burger. Flipping the burger only once during the cooking process will help prevent the burger from falling apart as it cooks. Since ground beef contains harmful bacteria, which is spread throughout all the meat, burgers should be cooked to 160 degrees Fahrenheit. While the “All-American” burger I described earlier is classic, since I love burgers so much, I love experimenting with new flavor combinations. 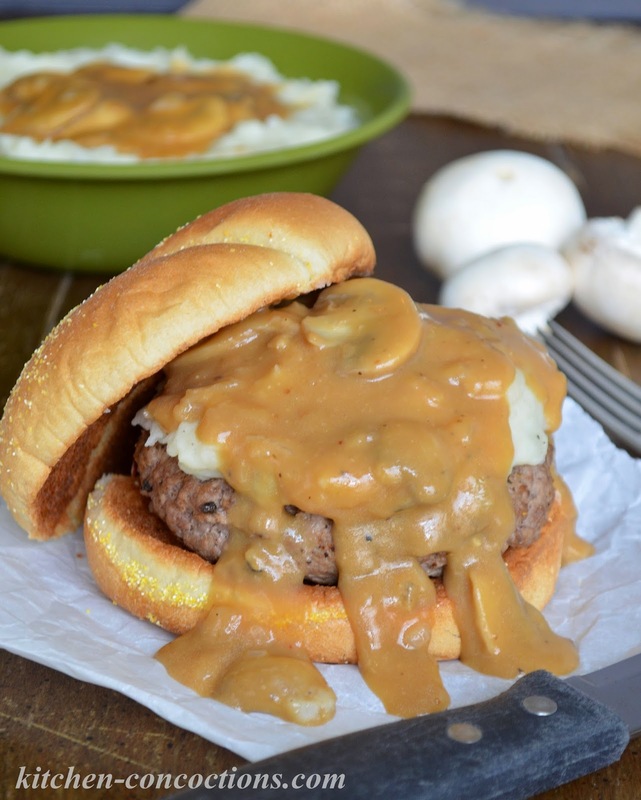 This Steak and Potato Burger combines all my favorite flavors of a fancy steakhouse dinner: a juicy, seasoned burger topped with creamy homemade mashed potatoes and a robust mushroom gravy! Go on, grab your knife and fork and dig in! A burger that combines all the favorite flavors of a fancy steakhouse dinner! In a large bowl, gently mix together ground chuck, ground sirloin, Stubb’s Steak Spice Rub and Stubb’s Texas Steakhouse Marinade. Refrigerate ground beef mixture for 20-30 minutes. Meanwhile, preheat grill to high heat. Once ground meat is well chilled, wet hands with cold water and divide into six equal portions. Be careful not to over work the meat, and shape beef into ¾-inch thick patties. Using your thumb, press a small dimple in the center of the formed burger. Season prepared burgers with salt and black pepper. Transfer burgers to preheated grill. Cook burgers for 4-5 minutes per side, or until cooked through. Bring a large pot of water to a boil. Carefully add peeled and diced potatoes to boiling water. Cook until the potatoes are tender, about 12 minutes. Drain water and return cooked potatoes to the pot. Add milk and butter to pot with potatoes. Using a potato masher or electric mixer, mash the potatoes until desired consistency is reach. Season to taste with salt and black pepper. Melt butter in a medium sized pot over medium heat. Add onions and cook, stirring occasionally, for 10-12 minutes or until onions start to caramelize. Stir in mushrooms and cook for 3-4 minutes. Stir in garlic and cook for 30 to 60 seconds. Sprinkle flour over cooked vegetables, and stir to combine. Cook for 2-3 minutes, stirring constantly. Add 1 cup of beef stock, stirring constantly until fully incorporated. Stir in remaining stock and milk. Season gravy, to taste, with Stubb’s Steak Spice Rub, salt and black pepper. Reduce heat to medium-low, and simmer until thickened, about 10-15 minutes, stirring often. Place cooked burger on the bottom toasted bun. 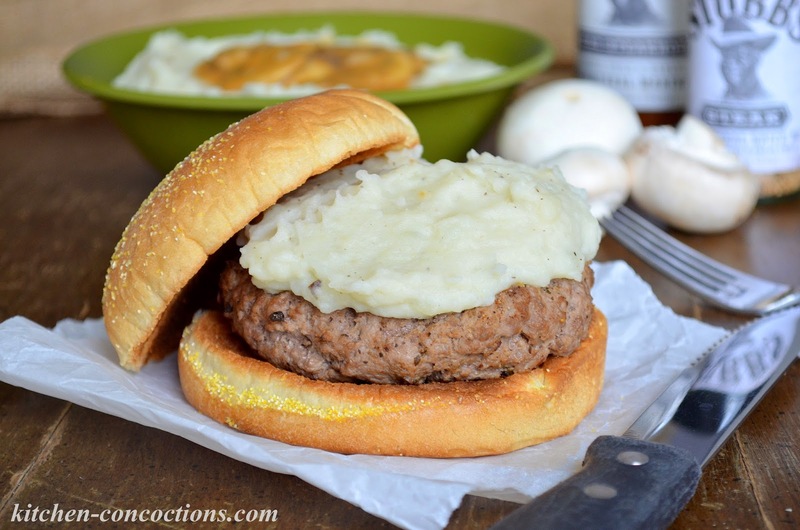 Top burgers with approximately 1/3 cup mashed potatoes. Top mashed potatoes with 2-3 tablespoons prepared gravy. Top gravy covered potatoes with remaining bun. Serve immediately. Disclosure: I am in a working relationship with Stubb’s Sauces and Marinades. This recipe was developed by me for Stubb’s. This blog post was written by me on behalf of Stubb’s. All thoughts and opinions are my own. Because of sponsors like Stubb’s I am able to continue to bring you all the content I feature here.